I served this delicious Moroccan dip as part of a Middle-Eastern Mezze. This mezze consisted of toasted pita chips, sliced crusty bread, Spiced Labneh (Yoghurt Cheese), Honey Spiced Eggplant, Taktouka Salad, Couscous Salad, Moroccan Olives and Harissa. The star of the meal was a chicken b'stilla. This is a very easy to make ahead appetizer recipe. All of the ingredients are readily available - except for the spice Sumac. I happen to have Sumac in my pantry because I cook quite a bit of Middle Eastern food. Sumac has a tart sour lemon taste. If you don't have Sumac you can substitute lemon zest and paprika. This dip can be made vegetarian if you use a soy yogurt. 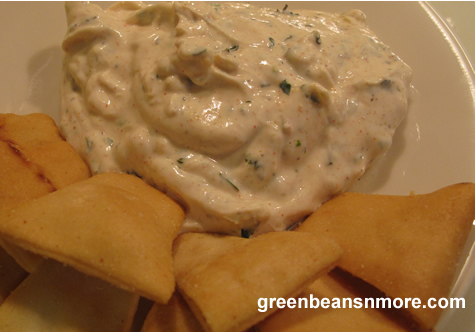 This recipe is proof that a vegetarian dip can be flavorful! Line a colander with cheese cloth or 2 layers strong paper towels. Spoon yogurt in colander. Place colander into large bowl to catch liquid that drains and place in refrigerator at least 8 hours, overnight is better. Move the drained yogurt into a large bowl. It should be quite firm. Discard liquid. Mix in the herbs and spices, salt and pepper. Spoon yogurt into serving dish. Just before serving drizzle with olive oil, garnish with fresh mint and coriander.